Ding-dong! Who’s there? All the info you need on buying and setting up the best bell for your entry. Ever since we’ve had doors, we’ve been re-inventing ways to be alerted to a visitor’s arrival. Hefty iron knockers gave way to tinkling bells that chimed at the turn of the handle, and today, technological advances have made doorbells more versatile than ever. Whether you’re updating your entry and want to replace an old doorbell with a more inviting model or you’re looking to upgrade to something “smart,” we’ll guide you on how to choose as well as how to install a doorbell that’s right for your home. There are three doorbell options available today: hard-wired, wireless, and Wi-Fi-capable (which link to your home’s router, in either wired or wireless versions). Three components are involved in a standard hard-wired doorbell—the button, the chimes, and the transformer—which you can purchase separately or together in a kit. Wired doorbells run anywhere from $20 to more than $200 for decorative chime units and smart technology features. Hard-wired doorbells are generally installed during the construction of a home when an electrician can easily run wires into the unfinished walls. 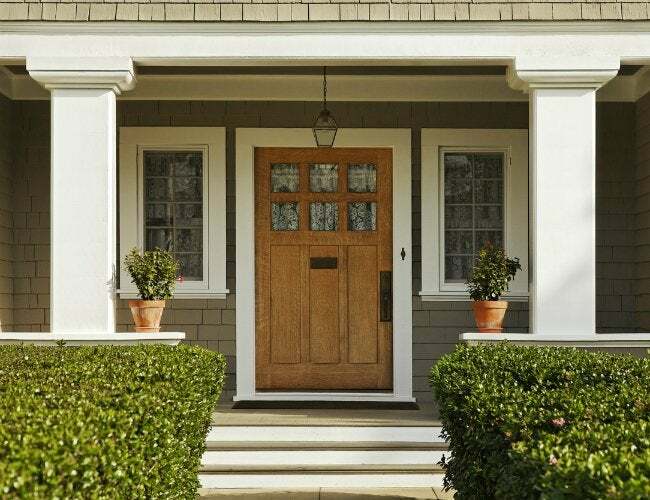 If your home was never wired for a doorbell, installation can be costly because new wires must be “fished” through the walls, a labor-intensive process. Installation tips: The bell’s transformer reduces a home’s standard 120 volts to less than 24 volts in order to accommodate the low-voltage wires that connect to both the button unit and the chime box. Because you’re dealing with low voltage, installation can be relatively DIY friendly. • A wired doorbell is linked to your existing electrical, so you’ll first have to shut off the power to the bell at the breaker box. • If the transformer (generally located in your home’s utility room or attic) must be replaced, higher voltage will be involved. Unless you’re knowledgeable in home wiring techniques, it’s best to call a licensed electrician to replace it. • If using the existing transformer, you may be able to easily replace the chimes and button yourself. Remove the existing components and attach the low-voltage wires to the new bell and chime n box per the manufacturer’s instructions. Switch the breaker back on and the bell is good to go. Going wireless is often the best option if your home doesn’t have existing doorbell wiring; it’s also a good choice if you like the idea of a portable chime box you can put in any room. Chime units often plug into standard indoor outlets, and some wireless doorbells come with multiple chime boxes that you can place in different rooms. When shopping, check the packaging to determine maximum wireless signal distance, usually between 700 and 1,200 feet, to ensure that the chime box will sound if you set it in a back room. Inexpensive units start at $15 (your basic door button and plug-in chime box) and can cost more than $200 for smart units. Installation tips: This is super simple, though removing an old doorbell can take some expertise. • First, attach the plate that holds the button unit to the front door casing or siding with screws. • Then snap the button unit into place. Many wireless doorbell button units are snap-in/snap-out to simplify battery-replacement. • After installing the button unit, plug the chime box receiver into an inside power outlet and you’re ready to receive. • If replacing a wired doorbell with a wireless unit, you can leave the old one in place if you wish. • To remove it, however, first shut off the breaker. Then, after removing the old button unit, you’ll see two leftover low-voltage wires. You can simply wrap the bare wire ends with electrical tape and tuck them back into the wall, or twist plastic wire nuts over each of the wires. But if you want the old transformer removed, it’s best to engage an electrician to safely terminate wires. A Wi-Fi-capable doorbell connects to your home’s wireless router and allows you to monitor visitors from your smartphone or PC. Smart doorbells can be either wired (meaning you’ll need existing doorbell wiring to hook them up) or battery operated to be completely wireless. Options include cameras with or without night vision, intercom capabilities, and motion sensors that send an alert to your smartphone when someone approaches your door. Smart doorbells start around $150 and can cost more than $300 depending on the extras you select. Setup tips: Get this one done and you’ll be able to monitor your doorbell from anywhere. • Install the button unit for either a wired or wireless doorbell. • Sync the button unit to your home’s Wi-Fi router and to your smartphone. This process will vary, depending on the manufacturer, and will likely require downloading and installing an app on your phone that will allow you to monitor the doorbell features remotely.